If you read my blog regularly you'll know I try & keep in shape with daily runs & workouts in the garage - very glamorous I know but believe me it's a lot easier to fit in than having to go to a gym not to mention cheaper in the long run & of course a lot less intimidating being able to work out in private with bedhead hair & generally not looking your best! I for one, having known the pre-exercise me, still find it unbelievable that I now get excited about lycra & new trainers but I can honestly say I find it just as exciting as new clothes! You may recall that I've previously reviewed some sportswear pieces from Ilu Fitwear here & can honestly say it's some of the best sportswear I've worn, so when they recently got in touch to see if I'd be interested in styling one of their jackets 3 ways I immediately said yes! The jacket they sent me is this beauty. Which as you can see in the below picture has some gorgeous detailing for sportswear. 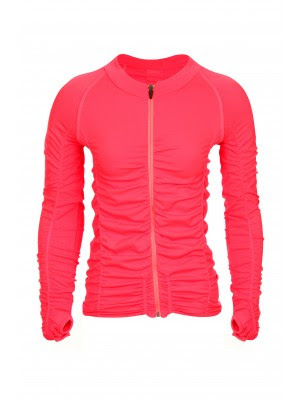 Plus it's a stunning hot coral pink that is perfect for brightening up the dullest of gym wear & if like me you're a road runner, now we've got our lighter mornings it's perfect to wear for visibility purposes & so much nicer than a reflective bib! Not to mention the ruched detailing helps distract from any unwanted lumps or bumps plus it's lightweight, comfortable & functional all factors which need to be considered. But most important of all it's made from quick-drying & sweat-wicking fabric to avoid any chill factor & another must for me it comes with thumbholes perfect for keeping my hands warm of a morning now that I can start ditching the gloves. So how would I style this jacket 3 ways? Well that's simples - firstly this colour is perfect for pairing with khaki & denim for the school run. Secondly there's wearing over the top of your gym wear & finally it's the perfect little jacket for teaming with your loungewear when relaxing at home. Back to my outfit for today & I thought for a change I'd share with you my look from this morning's run. Where as you can see I'm wearing my new jacket (I'm wearing size S/M). Plus I must admit to loving the fact my jacket picks up the pink in my new trainers, which won't be looking this white for long! Happy Friday ladies - I don't know about you but I'm looking forward to a couple of well earned days off running & exercising this weekend but if you're needing some new sportswear that will inspire you to keep at it then I can highly recommend Ilu Fitwear - beautifully designed, flattering, well made & with splashes of bright colours to lift your spirits - what more can a girl want? !